"Machine vs hand embroidery designs"
Brother embroidery machines are one of the most popular brands that are purchased today. If you enjoy embroidery as a hobby or even as a job you will appreciate that top quality equipment is essential. The Brother brand has a comprehensive range of different machines that are available for both personal and commercial use. Choosing the ideal one for your needs may be daunting, and you will need to understand the different varieties before choosing one. Embroidery is a very personal hobby, and many people can sit and embroider for hours creating amazing colorful designs. Using a machine steps up the process and you still have a wonderful outlet for your creativity. Having the perfect machine is essential to allow you to create amazing pieces of artwork. Brother is the market leader in embroidery machines, they understand exactly what enthusiast's need, and want from their machines. Every machine that is touched by Brother offers high speed performance, great technology, and incredible features all contained in a modern and stylish design. The Brother embroidery machines makes are designed to give the user many features to enable them to embroider faster and more effectively. One of the most popular features is the quick load thread cassette. 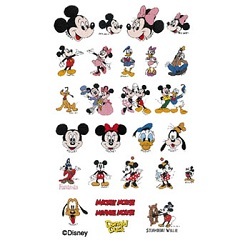 This feature is available on many of the embroidery machines including the ever popular Disney model. 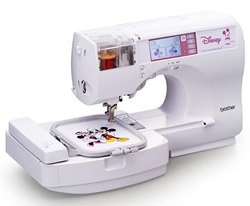 Not only does this machine have some amazing features it also comes loaded with over 27 Disney designs and 98 different stitch features. The concept of the quick load system is to allow the needle to be threaded automatically. Saving vital time when you are trying to complete a piece of work. Auto size button holes and pre selected design features are some of the other great time saving features available. Although the Brother brand has continued to grow they have remained loyal to their customer base. Taking the time to understand what people need, want and can afford. Although the technology that is used in their embroidery machines today is fantastic it is, however, not too complicated. 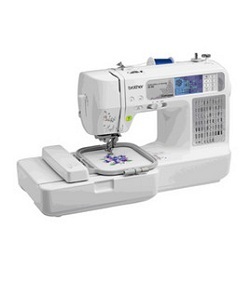 Whether you are a beginner or a very experienced embroider, the Brother embroidery machines will suit your needs. There is a machine suited for every skill level, and once you feel ready you can easily upgrade the model to the next one. The incredible technology in the machines allows even the most novices of people to create fantastic pieces of artwork. The designs of the machines make them appealing to all ages, and they are in fact encouraging younger people to try this great hobby. The editing and designing suites on the machines are touch screen making them easy to use, and great when you are learning. No matter what age or skill level you are there are Brother Embroidery machines that will suit you perfectly. Once you have the hang of it, you can easily download new designs, and patterns from the internet. The Brother website is a wealth of knowledge and information, and can help with any design issues or problems. You can also download the latest patterns from there, and keep up to date with new machines and features being released. Creating amazing pieces for friends and family will become the ideal personal gift. Once you begin to embroider you will find that it becomes a passion, that you will continue doing for many years.